Teshuvah | It's time to return to a place of purity of heart. It's time to return to a place of purity of heart. It could be that the subject of this photo adorning my home page is familiar to you. If not, please allow me to fill you in on the essence of what you are viewing, by way of a cursory overview. This site in Old Jerusalem (Israel) is known in phonetic Hebrew as “HaKotel,” or “The Kotel,” more commonly known in English as “The Western Wall.” The wall is positioned westerly of the Temple Mount (the golden dome over the previous location of the Ark of the Covenant, which can be seen in the upper-left of the photo) and is an actual remnant of the Second Temple, the construction of which began approximately 19 B.C., under the direction of King Herod the Great. 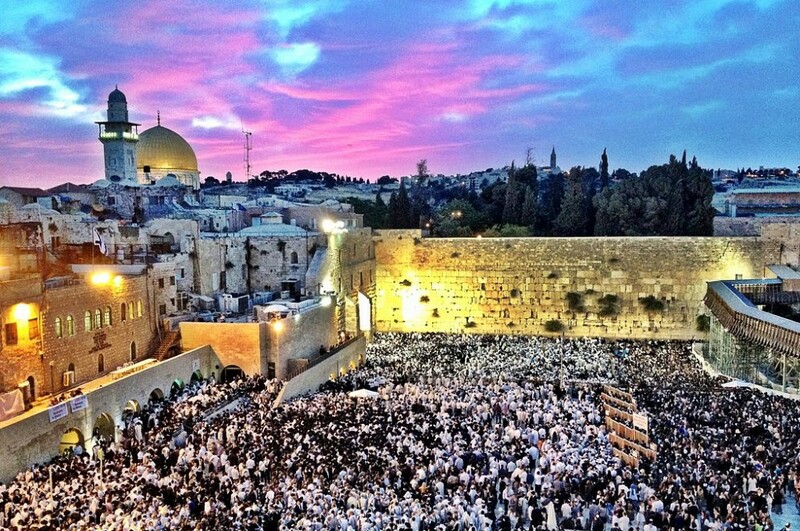 Hundreds of millions of prayers have been prayed at this site, for over 2,000 years. The subsequent spiritual dynamics intrinsic to this wall are very difficult to define. Having personally prayed at this wall on many occasions (to include just under two weeks ago, at the time of this writing), I deem these experiences to have been of the most precious of my lifetime, for it was at this wall upon a previous visit to Jerusalem that I experienced a spiritual heart-cleansing that would alter the course of my life. In fact, I would go so far as to assert that without exception, everyone who prays at the Western Wall is changed with each visit, to one degree or another, whether knowingly or unknowingly. As I say this, I would grant that the endless encounters at this wall could very well be due solely to the heightened expectation and anticipation of those praying, for God very often responds to the same–with His presence—where ever that happens to be. At the same time, one must also wonder what an infrared x-ray heat-score within an inanimate object looks like–after millions upon millions of prayers have been prayed over such. Old Jerusalem and the remains of Solomon’s Temple can, theologically speaking, be deemed “the holiest place on earth.” One could readily counter this statement by arguing that theologically speaking, wherever God happens to dwell is “the holiest place on earth,” for God dwells throughout the universe—He is omnipresent. I would have to agree with the latter, even going so far as to say that one could actually experience God’s presence in Cleveland—of all places. Nonetheless, the Western Wall yet remains host to the most permeating presence of God that I have personally experienced in the 32 years that I have sought to draw nearer to Him (to also include the many seasons in which I have run from Him). It is worth noting that my experiences at the Wall during 3 separate journeys to Israel were preceded by a 21-day fast. Such laid the intrinsic groundwork for my profound experiences therein. When one fasts, their spiritual antennae (if you will) move to the fully extracted position, enabling them to more clearly see, sense and hear the ebb and flow of the Holy Spirit. It is for this reason that my journeys to Israel, and especially my prayer-time at the Western Wall on many occasions within the 3 trips to Israel to date, have been embedded in my memory for a lifetime. “Teshuvah” (תשובה) is a Hebrew word, which means literally, “to turn,” as well as to “return,” and connotes a posture-of, or a call-to, repentance. It is teshuvah—the call to turn, to repent, and to then return to a place of purity of heart, which will remain central to my offerings on this site. Barring a physical journey or pilgrimage to the Western Wall; what and where, may I ask, is your Western Wall? Where is that wall of circumstances that will force you to stop, and to turn—to embody teshuvah—a turning away from that which defiles—and a return-to a place of purity of heart? Where is that holy place which makes way for such transformation? As we fully yield ourselves to God’s ways and means, and we daily practice the posture of “waiting at His gates and the posts of His doors” (Proverbs 8:34) by stilling ourselves before Him and contending for His voice, we are given the gift of elements of revelation which, when formed together with many other elements, produce a panoramic view of God’s handiwork throughout the globe. In this context, it was the Apostle Paul who, within the “B’rit Chadasha” (Hebrew for New Testament), stated that “we all see in part…know in part…prophesy in part…and look into a mirror dimly…[or]…as through a glass darkly” (1 Corinthians 13:9-12). As such I will concede that my message to you herein is but one within a spiritual kaleidoscope of messages that must be heeded in this hour. This to say that I do not expect the reader to don my personal spiritual lenses, as again, we all “see in part.” I simply ask you to meditate upon the “part” that I see, and see where it fits within the kaleidoscope—the kaleidoscope which begins at the Cross. I look forward to dialogue with many of you as time unfolds.